So if you follow me on instagram you’ll already know that last weekend I was taken away to Santander on a surprise birthday getaway by my lovely boyfriend! I know what you’re thinking.. I thought that was a bank? It’s not the obvious choice I’ll give you that but our good friend lives there and it’s actually perfectly Spanish and untouched by tourism! I’ve been to Santander once before and what I love about it is that you’ll be walking down a street with the most beautiful buildings ( see above photo – the original Santander Bank!) on your left, the docks on your right, the beach up ahead and the mountains in the distance. Where else can you get all of these wonderful sights combined?! 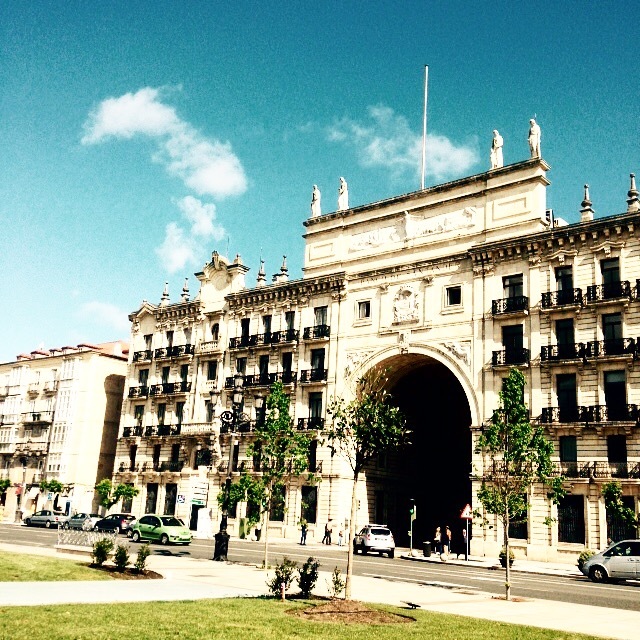 There’s two sides to the fact that Santander is untouched by tourism, the good and the bad. The good is that the beach is empty, the streets are peaceful, we didn’t see one piece of rubbish the entire time we were there, you get to experience the cultural side more than you would in the Costa del Sol. The downsides, well.. there’s just one, the food. Not necessarily the food itself but more the activity of eating. As both me and Jack are non Spanish speakers, and it would appear that not one soul in the whole of Santander spoke English, the language barrier was very apparent. The food we ate was always a surprise.. one day when we asked a taxi to take us somewhere he held up a tennis ball.. true story! Spanish people do not eat at normal times either, you can have a three course meal at 2-4 in the afternoon, or you eat at 10pm, the rest of the day all you’ll get your hands on are pinchos! Pinchos are usually small pieces of french stick with interesting combinations of unrecogniseable food, they’re delicious if you hit the jackpot and it’s worth taking the risk! Whilst we were away we went to San Sebastian for a couple of days, it was slightly more touristy there but still the language barrier! Our apartment was right on the front by the beach which is full of surfers from 7am to 10pm, so when the weather was bad we sat in bed watching the surfers, eating tapas and drinking wine, perfect!